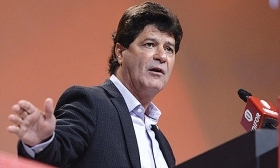 Unifor President Jerry Dias says "wages have barely kept up with inflation." The early-May strike at a Toronto-area Lear Corp. seating plant was the latest labour dispute to come as Unifor shifts to a more aggressive bargaining strategy. Unifor President Jerry Dias said the union is bargaining “a lot differently” today than it has in the past. Workers in the auto sector and elsewhere are fed up with stagnant wages and the impact of globalization, he said. The union represents 23,500 members working at the various facilities of General Motors, Fiat Chrysler Automobiles and Ford. It represents another 16,000 members at various parts facilities. A more aggressive approach in labour talks apparently played a role in recent strikes. The weeklong Lear strike in Ajax, Ont., which briefly shut down production of the Dodge Challenger and Charger and Chrysler 300 at a nearby Fiat Chrysler assembly plant, stemmed from a dispute over wages and benefits. It came on the heels of a month-long strike last year that shut down production at General Motors’ CAMI Assembly plant in Ingersoll, Ont. Unifor also walked off the job at supplier ZF-TRW in Windsor, Ont., for two days in March, idling FCA’s minivan production at its Windsor assembly plant. Unifor’s aggressive approach — and angry membership — has struck outside the auto industry, too. Members of Unifor Local 444, which also represents FCA workers in Windsor, have been on strike at Caesars Windsor for 53 days. “Working-class people are frustrated as hell. If you analyze globalization, workers have been left behind. They see record profits, but wages have barely kept up with inflation,” Dias said. The Lear strike was resolved May 4 with a new deal that includes a 15-per-cent rise in wages over the life of the four-year contract, to as high as $27 per hour, in addition to a $2,000 bonus. Unifor said the contract also included Lear withdrawing a notice it had given the union on May 2 that it would close the plant in response to the strike and workers rejecting a previous deal. Unifor said FCA became involved in negotiations following Lear’s notice to the union that it would close the plant, which is a just-in-time supplier to the Brampton factory. Dias credited an FCA representative with getting Lear back to the negotiating table. Windsor Mayor Drew Dilkens has now offered to help settle the casino strike. The Lear Ajax plant closed once before, in 2009, when General Motors closed its Oshawa Truck Assembly plant, which it supplied. It re-opened the following year with new business from the FCA Brampton plant, though workers returned to the job at wage rates lower than what they had previously been paid and below what workers at a nearby Lear seating plant were paid.